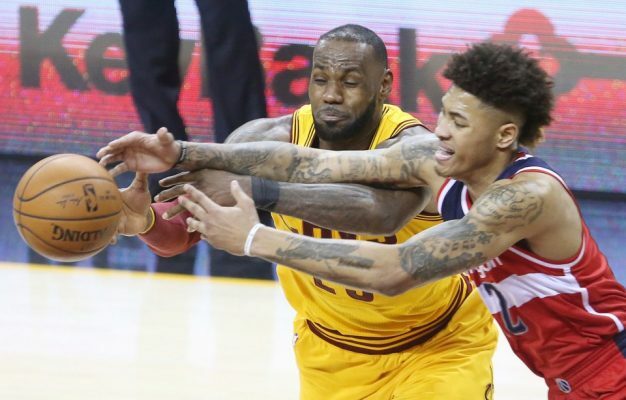 (Cleveland, OH) – After falling behind by as many as 17 points during the first half, the Cleveland Cavaliers were never able to dig out of that huge hole as they fell, 127-115, to the Washington Wizards on Saturday night at Quicken Loans Arena. The Wizards managed to jump out to a 50-33 second-quarter lead, primarily due to their unconscious shooting that saw them connect on 21 of their first 27 shots from the field, including 18-of-22 (82 percent) during the first period. Though they cooled off somewhat during the second quarter, Washington was still shooting at a 70 percent clip after two quarters. The Cavs chipped away at that 17-point deficit until they were able to get it down to six at 65-59 with a minute left in the half. However, the Wizards scored six of the final eight points to take a 71-61 halftime lead. During the third quarter, the Cavs managed to make it a one-possession game with 1:28 left, but they trailed by five at the end of the quarter and got no closer than four points for the remainder of the game. LeBron James collected a double-double with 24 points and 11 rebounds, while adding eight assists. 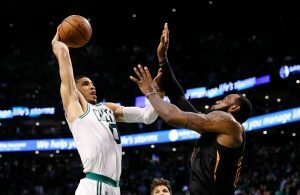 Right behind him was Kyrie Irving, who scored 23 points with four assists, while Kevin Love contributed 17 points and seven rebounds. Two reserves, Richard Jefferson and Kyle Korver, each tossed in 10 points apiece, while Iman Shumpert missed the game due to a sore right knee. 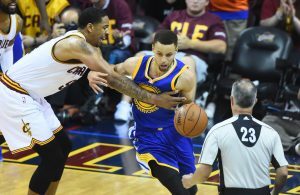 “Right now, we have to try and keep trying combinations and figure out what works best,” Lue said. On Washington’s side, its backcourt of John Wall and Bradley Beal was responsible for a good portion of the damage, combining for 64 points on the night. Wall scored 37 of those, including 18 during the first quarter, when he hit on all eight of his field-goal attempts. As a team, the Wizards finished shooting 60 percent from the field. “They got off to a hot start and never looked back,” Irving said. After suffering a corneal abrasion to his right eye during Friday night’s win in Charlotte, James began the game wearing tinted goggles. That idea didn’t last long as James flung the goggles to the sideline in frustration with 3:37 left in the first quarter after he had missed his third outside shot. His two baskets up to that point had come on a pair of dunks. The Cavaliers face an even stiffer challenge on Monday night, when they travel to face the San Antonio Spurs in a contest that some indicate could be a preview of the NBA Finals. Tipoff for that game will be just after 8 p.m. ET.